24 7 News Net - Sollog says where Serial Sniper will strike next! Famous Psychic Warns Where Sniper To Hit Next! On October 4th I did an interview with a person I have written a couple of books on. He is a world famous psychic named Sollog. His site is http://www.Sollog.com We casually discussed the news that day about the Rockville Maryland Sniper. He said the locations formed a satanic cross. He sent me a map that day via email. It is below. The first five murders do form an upside down cross. The next day a victim was killed in DC, which extended the cross into a traditional cross. Here is the original map he sent me. Since that conversation several more shootings have been connected to the serial sniper. A woman was struck in Virginia as was a 13 year old boy in Bowie Maryland. Another murder was connected to the sniper in Manassas Virginia. Sollog has bought to my attention many aspects of these shootings that prove what he told me the date the shootings started was accurate. The sniper is doing things to show a religious aspect to these terrible events. These are some of the religious connections in the serial sniper shootings to religion. Most of the shootings took place in MARYland the name of Jesus' mother was Mary. The rest took place in VIRGINia, as in VIRGIN MARY. No shootings took place on Sunday, a day of rest for God in Christian beliefs. The first six murders form a perfect cross in MARYland. The first five murders formed a satanic upside down cross. The Tarot card left at the Bowie shooting scene was the 13 or card of Death. 13 were at the last supper. The sniper claimed, "I AM GOD" on his Tarot calling card. Anther noteworthy aspect of these shootings is that most of the victims were minorities. The leaving behind of a playing card is a well known message of special ops soldiers. Either the Ace of Spades or the Death Card (Grim Reaper) of a Tarot deck are left behind by US Military Snipers. Sollog says another cross is forming from the locations chosen by the shooter. The most likely new locations where the sniper will strike according to Sollog are locations that will form crosses with previous locations. Sollog says these are the most likely new locations the shooter will choose. 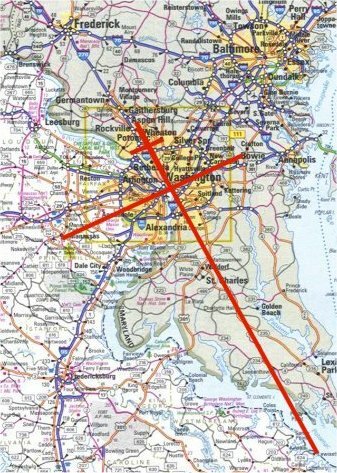 St. Charles area in Maryland, it forms a cross with Manassas, Bowie and Rockville. The toll booth area of Rt. 301 at the state border of Virginia and Maryland. This road is significant since it has 13 in it. 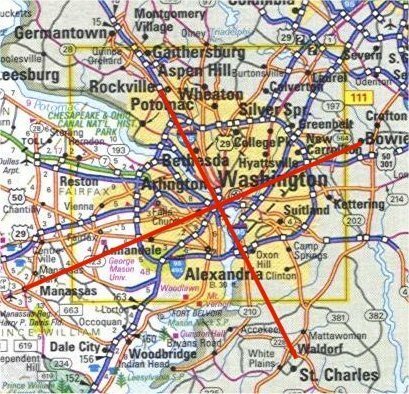 It forms a cross with Fredericksburg, Manassas and Bowie. Look for a rest area near the toll both as the target. 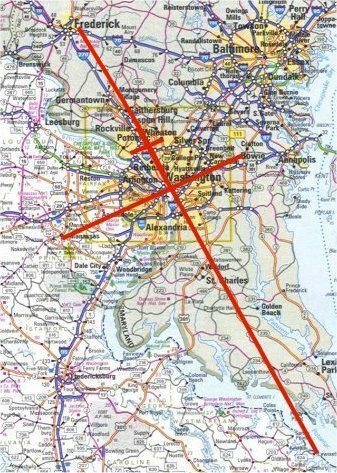 Leonardtown and St. Marys City in Maryland are also possibilities for future shootings since these areas form a cross with Manassas, Fredericksburg and Bowie. 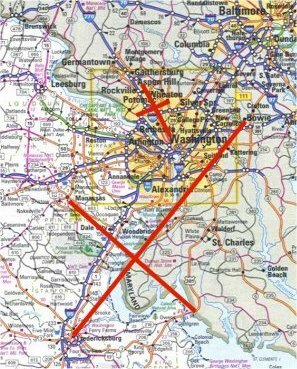 Less likely but possible areas to be hit by the sniper are Richmond Virginia and Frederick Maryland if the sniper is working on a new cross formation with Manassas as the key intersection point. 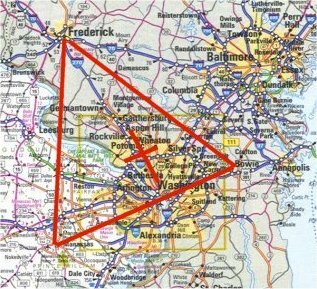 Frederick Maryland when connected to Manassas and Bowie forms an equilateral triangle with the original cross in the center of it. Consider it a Holy Frame in the mind of the sniper. Father, Sun and Spirit. The trinity. Frederick Maryland when connected to Manassas, Bowie and Sandy Point Virginia forms an double cross with the original Rockville cross. The Rockville Cross when connected to Sandy Point Virginia, Manassas and Bowie forms another double cross with the Rockville cross at the head. To any law enforcement agencies that read this. Sollog is UNDER GROUND due to death threats the US Government has made on his life. He is one of the most investigated people in the history of the FBI due to his public warnings of events like 911 and the Oklahoma City bombing before they occurred. If you wish to have Sollog help you then have a copy of a FULL PARDON issued to Sollog by President George W. Bush (email a copy of it to this site or his site). Sollog has been harassed with FALSE ARRESTS in the past and unless the President issues him a FULL PARDON he will remain UNDER GROUND. It is time for the US Government to acknowledge Sollog is here to help them and stop harassing him! Massaponax was the scene today of the eight MURDER and tenth DC Sniper Victim! Massaponax is at the head of the CROSS SYMBOL on a map where the famous psychic Sollog warned the sniper was most likely to strike again. The map with a line going through the Massaponax area to make a CROSS is above. I just finished an amazing interview with Sollog about this new Sniper hit. What he revealed to me will absolutely amaze you. I asked Sollog what he thought of the location chosen by the sniper today. He said, "The sniper is using location names, locations and even the names of the establishments to give a message to everyone. These are absolutely religiously motivated sacrifices. The sniper is hitting locations as I told you earlier that form Christian Crosses on maps. 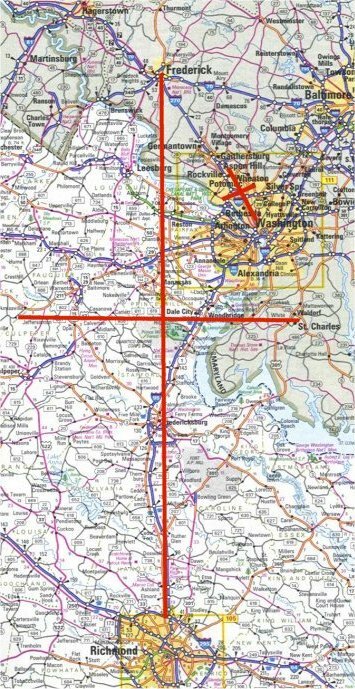 I told you about the Manassas, Fredericksburg and Bowie Cross and gave you a map of it. In satanic sacrifices you must KILL AN OFFERING. The fact the sniper went back to the Fredericksburg area to KILL shows he is performing a satanic sacrifice. 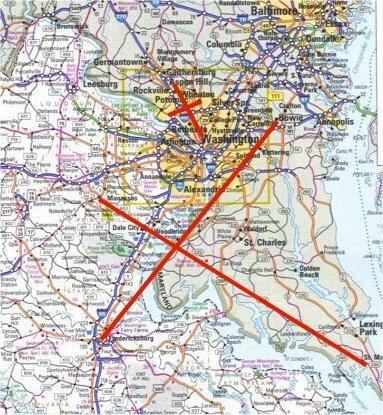 The Manassas, Bowie and Fredericksburg cross is a satanic cross, it is an upside down cross on a map of VIRGINia and MARYland. Virgin Mary is the name the sniper is spelling by choosing VIRGINia and MARYland. Today he chose MASSapONAX or Black MASS ON A X. The X is a CROSS. Why did he choose MASS today in the key location? Why MASSapONAX, or MASS ON A X? His locations are carefully chosen to give this message. EXXON is a clue also, X ON is the phonetic spelling of EXXON. So we have phonetically X ON MASS ON A X. Again the X is a Cross. In fact in ancient times X simply meant Christ or Christian Church. The substitution of an X for Christ is seen today in the use of Xtian for Christian. Some satanic groups also use an X when they mean Christ. The last location before today was in Manassas. It was a SUNOCO station. The location and establishment chosen by the sniper spells SUNOco MANassas. SUN O MAN is the hidden meaning of the last hit. SUN O MAN = SON OF MAN or Jesus. The police and FBI are not equipped to profile this serial sniper. They can use all the roadblocks they want. He probably uses a disguise when he shoots. His cars probably have hidden departments that he can put his weapons and disguises in. He can drive right by a roadblock and no one will find a weapon. If reports are true of two people being involved, one is most likely a woman who is disguised as a man. After the shooting is done the two men flee and then one becomes a woman. So the police look for two males and just pass the sniper through a road block since the car has a man and a woman in it. The sniper will be going back to an area aligned to Bowie to complete the sacrificial satanic cross I warned you off the other day. He has to offer a sacrifice or actual MURDER at the four points of the cross to make his black magic work. The sniper missed near Fredericksburg and Bowie, so these areas have to have new shootings. Today's killing in Massaponax is a redo of the Michaels in Fredericksburg area miss. This sniper should not strike on a Sunday due to it being a religious Holy Day in my opinion. He may very well respect the Jewish Sabbath of Saturday as well. Last week there were no shootings on Saturday and Sunday." So there you have it, Sollog hit the location of this recent shooting right on. It was on the main cross that he had warned us about the other day. This is the cross with the Fredericksburg area in it that we had on this site since the other day. Anyone can see the sniper hit a location he struck near before, in order to redo his mistake where a victim survived. 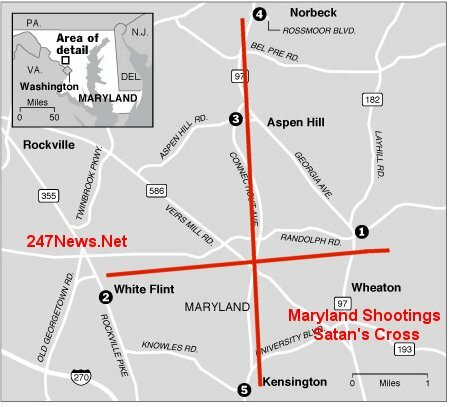 The sniper needs to redo his other miss with a killing near Bowie and then he has to strike where Sollog warned, near the state line of Maryland and Virginia near Route 301 to finish his satanic cross. Maybe the authorities can have that area covered with police so the sniper can be caught to end this terrible event. The way Sollog was able to connect the locations not only to a map forming a cross but to also show the locations and establishments are hidden phonetic phrases tied to religion is truly AMAZING.